After TBScon I came home with valuable tips from my friends and have really changed up my Instagram game. Today I’m sharing everything I learned and have found successful in growing an authentic Instagram following. Engage with the people who are already invested in you! Since I started doing this I have fallen back in love with Instagram. I was so disconnected from the people on there and now my favorite thing is connecting with the girls who reach out to me on Instagram. This is something I constantly have to work on. You have to post consistently for your followers to remember you exist. I’m guilty of going a week (or longer!) without posting and I’ve stayed at the same number of followers forever. Now that I’m posting daily or every other day at least, I’ve started to grow my Instagram following again. If you’re treating your IG like a business and not a personal account, it’s important to keep your posts “on brand”. Yes, your blog is a brand! If you’re a fashion blogger, keep your posts to fashion and add captions with personal stories if you want. You can save the off brand posts and topics for your Instagram stories or if you go live. This may seem counter-intuitive, but I recently started deleting and removing spammy followers or men following me that I don’t personally know. This was a tip from my friend, Lauren from Simply Holifield who has an amazing engagement rate on her Instagram account. These ghost followers are just ruining your engagement, which is what brands really care about these days. I also delete any followers that don’t have a profile picture and haven’t posted to IG at all. They are most likely bot followers and that’s not authentic! So far, I’ve deleted 1k and I plan to keep cleaning it up as I continued to grow. I was scared to post to stories, but that’s where the majority of your followers are looking these days! The goal is to get to the front of the line on the IG stories header. The accounts that the follower watches the most will show up here, so you need to post consistently to stay relevant.Always tag your location and add hashtags to your IG stories. To be safe, I usually don’t post to stories with my location until I’m leaving, but this is personal preference. You can hide hashtags by pinching the screen and making them really small. Growing your local community should be your first priority. It opens the door to work with local brands and people love connecting and seeing what other people are up to in their area. I notices from week to week when I’m not as active on IG stories my posts overall get less engagement. It’s so important to post not only on your feed consistently, but also on your stories! People want to see what you’re up to during the day and more “real life” on stories. I don’t do a lot of research when it comes to hashtags, but I always include them at the bottom of my captions because #whynot. Sometimes, I notice a large number of people found my post through hashtags, and other times no one discovered my profile through the same hashtags. I think it’s hit or miss, but you might as well use them. I started to engage on Instagram a couple of minutes before I post a photo. I stay there and reply to all my comments as soon as they come in right after I posted and I return likes and comments to other accounts. I’ve found this has helped significantly with my engagement. I think the more you engage on Instagram before and after your post the better, but don’t let it consume your day! Don’t just comment “cute” and move on. Spend the extra few seconds to write a sincere and authentic comment. You’ll stand out and people will be more likely to return to favor to your posts. The more engagement your posts gets the more impressions you will get on a photo. 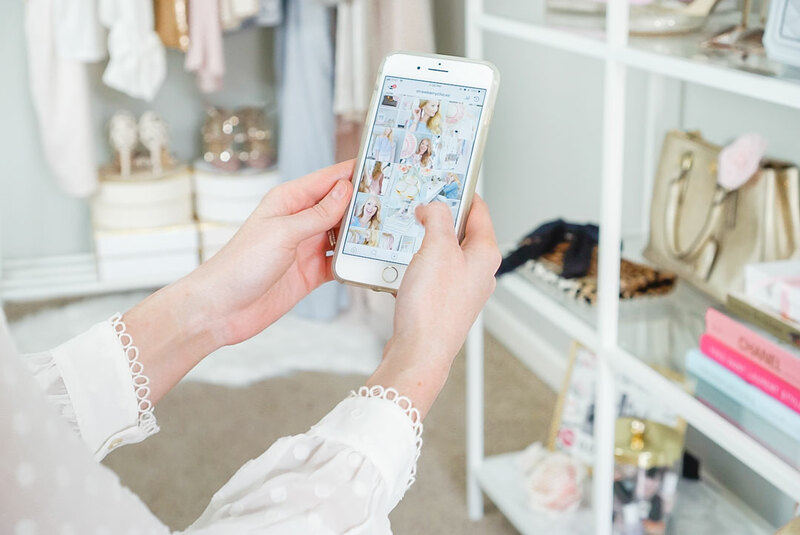 A quick way to gain followers in your niche is to partner up with other bloggers and share each others Instagram feeds with a tag. You want to team up with accounts that are similar to your content so readers will be interested in following. Also, I wouldn’t recommend reaching out to people who have a larger following than you and asking them to shout out your account. Ask people who you already have a relationship with first or girls who are in a similar point in their blogging business so the partnership is mutually beneficial to both accounts. Are you in an Instagram rut because of the “algorithm”? My suggestion to you is to stop worrying about the numbers you see on your account and start talking to the people you’re connected with on there. Doing so myself has made the platform way more enjoyable and you start doing it for the fun again. Let me know if you have any tips for growing your Instagram following!